Also called a roofing square and steel square this is a flat steel square with legs of 600mm and 400mm or 2ft by 18 inches. It can be used just a general square but it can also be used to perform roof and stair set outs by using sets of tables inscribed on both faces of the square. What you see above is a Lufkin framing or rafter square. It is made in the USA where I think that the idea of using inscribed tables as an aid in roofing was first used. The Stanley company comes to mind. The square in the photo is a metric square and of course imperial ones are also available. The square is particularly useful with the US system of describing the pitch of a roof as a ratio. As in say 4:12. It is simple to then place the square on a piece of timber with the tongue (the thin short leg)at the 4 mark and the base(the wide long leg) at the 12 mark and straight away the roof top cut and level cut are defined. 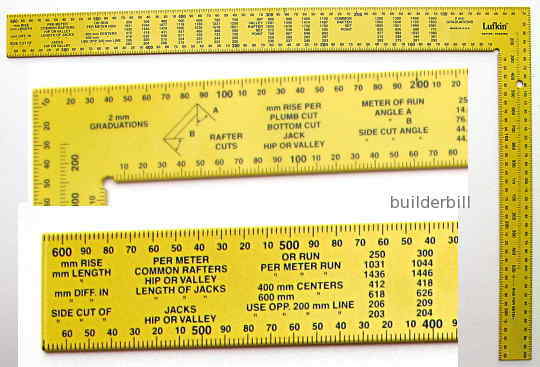 Personally I was taught a different system of finding rafter lengths and bevels. We use a system where an architect may specify a roof pitch as 22.5 degrees. In the right hands these squares have helped to build many roofs. However, only simple ones. As soon as things get away from standard the then the roofing square is not the tool for the job. It is of course an excellent and robust tool for general squaring work on the bench and on site. Also I do not recall ever having built a flight of stairs without one. Set up with a couple of battens screwed to it like in the sketch it is the absolute best method of marking stair angles.